A package of 10 pcs. costs 1259 USD. High Aspect Ratio NCH type is designend for non-contact- / tapping-mode, high resonance frequency mode. The AR5T type based on the POINTPROBE® series. 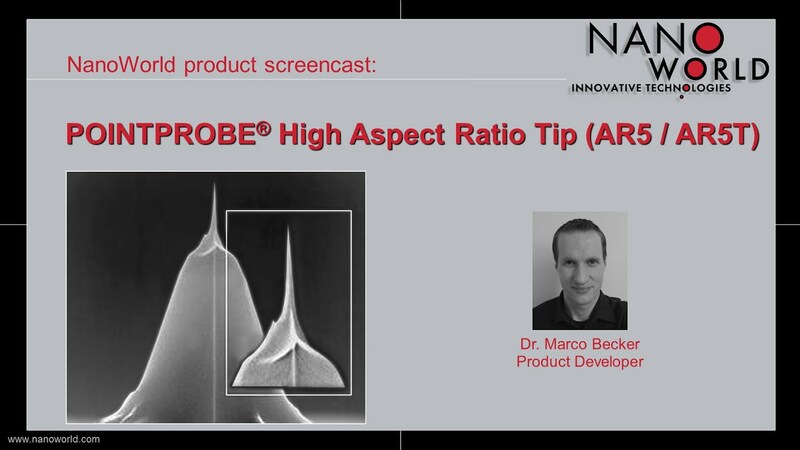 This type offers unique features: length of the high aspect ratio portio of the tip < 2 μm, typical aspect ratio of this portion in the order of 7:1, half cone angle < 5° of this tip portion. Tilted 13° to the center of the tip axis of the tip for measurements on samples with sidewalls approaching 90°. POINTPROBE® sensors are made from monolithic silicon which is highly doped to dissipate static charge. The are chemically inert and offer a high Q-factor for high sensitivity. The tip is shaped like a polygon based pyramid. Additionally this probe offers an excellent radius of curvature.